In this soliloquy, Hamlet’s view of life is that it is full of hardship. He presents life as being two options; “to suffer the slings and arrows of outrageous fortune, or to take arms against a sea of troubles”. The use of imagery with connotations of war shows Hamlet to see life as a constant battle. The weapons mentioned are long range suggesting the possibility of being unsuspecting of the attack. This also lends itself to the possibility of missing which links to the “outrageous fortune”. The adjective ‘outrageous’ is possibly used to emphasise the connotations of fortune as it can mean the inability to predict, but it also has connotations of being more than is required. 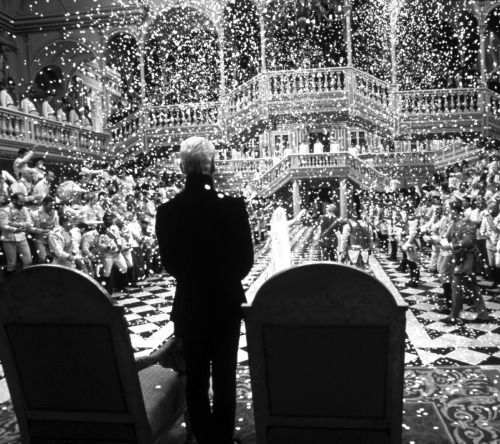 Hamlet, therefore, feels as though the odds are weighted against him. This is furthered by the metaphor used of a “sea of troubles” which equates his problems with the vast expanse of the sea and its power. These images are contrasted with Hamlet’s description of being “shuffled off this mortal coil” as the verb ‘shuffle’ is usually linked to embarrassment or awkwardness. This betrays Hamlet’s view that much that we do is pointless; the heroic deeds we believe to have done are just little actions. The specific problems Hamlet experiences are hinted at by the “thousand natural shocks that flesh is heir to”. Not only may this mean his mother’s incestuous marriage with Claudius that upsets Hamlet, but also his dead father who returns as a spirit telling him to avenge his death which causes much of Hamlet’s anguish. This phrase may also mean the actual effects of aging or being wounded. Similarly, Hamlet calls life a “calamity” and a “mortal coil”; ‘coil’ may mean a literal coil which goes back on itself, or it may mean confusion which is the more probable meaning. Each of these examples demonstrates Hamlet’s view of the world as confusing and against him. The very reasons for this soliloquy show this as Hamlet is trying to reason with his conflicting thoughts on death. In this post I shall tackle Hamlet, a formidable task which I feel I will not be able to do justice to its words. This feeling is one that Hamlet may have felt, and one we all feel when posed with such questions whose answers seem beyond our reach. Due to the play’s reputation, when I did read and watch Hamlet, I felt obliged to see its deeper meaning. I certainly did, but I question as to whether it was due to what I have heard of the play or what I truly felt. TS Eliot said that Hamlet “is dominated by an emotion which is inexpressible, because it is in excess of the facts as they appear”. It is this excess that I find hard to come to terms with. I even might entertain the possibility that it is us, the audience, who have added this excess. This, however, can be argued for any interpretation so I will cease my pondering on this subject for the moment. To clarify, I am not saying that Hamlet is devoid of the meaning we see in it. I found it a very emotional play and the questions I found being posed to me are ones that we need to think about. As I first ventured to read this poem by Milton I was somewhat apprehensive. With a little concentration, however, and the help of Google, I found myself enjoying reading it very much. I think that this is partly due to its similarity with Wordsworth’s poems, a poet I am very fond of. This is due to the pastoral nature of Lycidas, the idealisation of country life which both poets do; “What hard mishap hath doom’d this gentle swain?”, swain meaning country youth or shepherd. This is similar to Wordsworth’s There was a boy in which he paints a picture of a boy perfectly in tune with nature and therefore completely at peace. Milton’s excessive use of imagery containing nature and plants furthers how pastoral this elegy is. He mentions the “rathe primrose” (rathe meaning ready to bloom), the “pale jasmine”, the “white pink”, and the “glowing violet”. I particularly like the last description, and the combination of all of these in one stanza creates a vivid picture in the reader’s mind. Despite the poem being an elegy, mourning a dead friend, this inclusion of spring and new life connects Lycidas’s death with life, and therefore places Lycidas within the whole cycle of nature and mother earth. In There was a boy, Wordsworth does the same thing when he describes the boy “while he hung listening”; the use of the word ‘hung’ gives of the impression that he was no leaving to go away from the vale, that he is part of the landscape. His death is also part of the landscape as the church yard in which he is buried also “hangs”. Lycidas makes several references to Virgil’s Ecologues, which is considered the first poem in a classical style on a pastoral subject, such as the line “Who would not sing for Lycidas” which comes from “Who would not sing for Gallas” in the Ecologues. Furthermore, Lycidas is anachronistic (not chronological) which is like the original pastoral elegies.